"Designed with mobile crafting in mind, my English paper piecing travel kit has two main compartments—one for holding fat quarters and spools of thread and the other for organizing stitched hexies and finished blocks—plus an outer pocket that’s the perfect size for two altoids tins—one for paper templates and one for sewing supplies—and a pair of scissors. Closed and fully loaded, the travel case is a 6" x 6" square that’s only about 3" thick, so it’s the perfect size to toss into a purse, tote, or project bag. Ready to make one of your own? 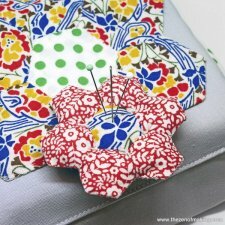 "Enhance your on-the-go quilting experience with a handy little pincushion designed specifically to snap onto the pocket of my popular hexie-inspired pouch! When you’re stitching on the go, use the male side of the snap on the back of the pincushion to attach it to the female side of the snap on the pocket of the travel kit. Then, when you’re done sewing, simply unsnap the pincusion and store it inside the kit until the next time you need it." 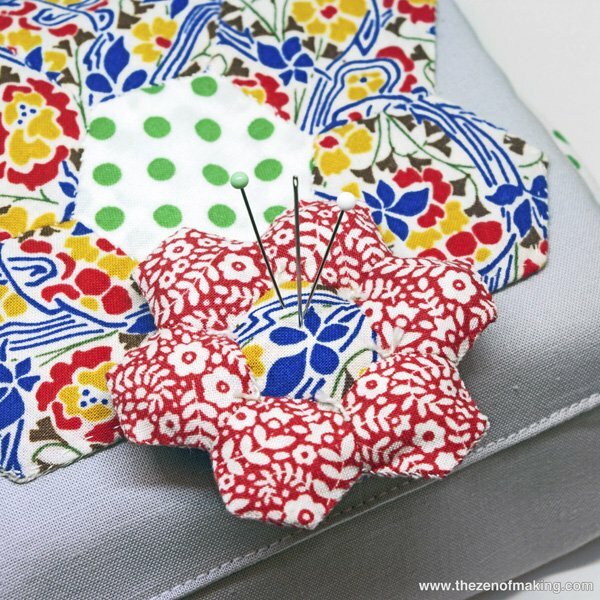 Note: You will find the link for the pincushion tutorial as well as Haley's downloadable PDF of the project and the supplies needed at the travel kit project page linked below. 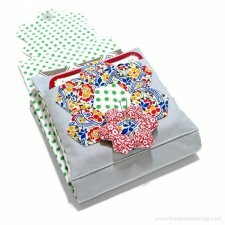 Haley also provides tutorials on English Paper Piecing Hexies in two parts that is quite excellent, if you are new to the craft. You can find the links for those at the bottom of the travel kit tutorial.